R.eaders I.mbibing P.eril Challenge (R.I.P.) 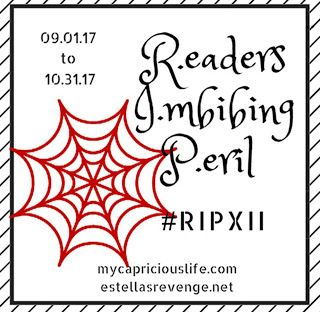 hosted by Estella's Revenge and My Capricious Life. I've participated in this fun fall challenge for the past few years, and I always enjoy it because I like reading a bit of dark stuff (not too dark), but I don't always find the time. I used to read suspense, mystery, and thrillers almost exclusively, until I discovered reading groups and reviewing and broadened my reading horizons. And my husband LOVES to read this stuff. So, my TBR bookcase (yes, an entire bookcase!) includes lots of good creepy stuff. In September and October, I enjoy focusing on that and also making a dent in my TBR pile! Now, before you say, "Oh, I don't read horror," let me explain that the R.I.P. Challenge is pretty broad - it includes anything a bit dark: mysteries, suspense, thrillers, supernatural or paranormal, gothic, and yes, horror, too. So, the books you read can be as scary or wimpy as you prefer. Most of mine are suspense. mystery, or thriller. I actually started this challenge back on September 1, when it began, but this is my first chance to officially sign up and post about it. Don't the covers all look creepy? They kind of match. Though, to be clear, none of the covers have spiders printed on them - I got the Halloween decorations out and added those for effect! I'm having so much fun already and can't wait to read the rest! Do you enjoy reading anything creepy or suspenseful? Join the fun and sign up at the link above. I don't read horror, but R.I.P. is one of my favorite challenges--I'm reading all my favorite mystery series plus a couple of extras for my challenge. It's my favorite reading season. I'm reading a thriller now and look forward to some Dracula related reads soon. I listened to Dracula (the classic) on audio last fall for the RIP challenge - for the first time! - and I loved it.